Canvasback's Coral Anniversary Gala — Canvasback Missions, Inc. 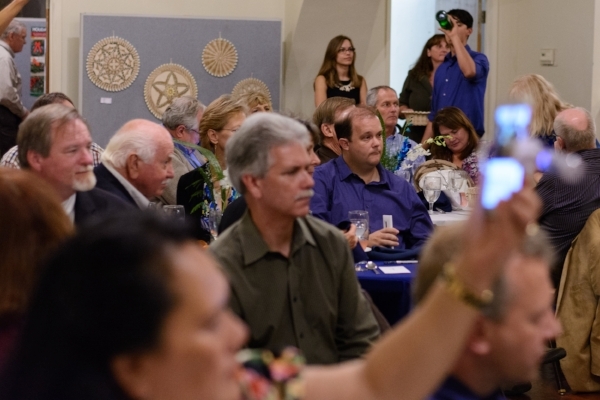 Many of you came out to support our gala, where we raised money for the mission and celebrated our 35th anniversary. We saw old friends, past volunteers, and family. The mission was incredibly blessed to be joined by the Sacramento Marshallese community and have two fantastic dance groups bring life to the dinner: Jurbak in Mejit and the Flag Dancers. The event was a complete success—so many people came that we had to roll out extra tables at the last minute. Luckily, the Benicia Camel Barn Museum had the space available, and it proved to be a lovely venue. Guests raved about the food, provided by No Worries: Filipino Vegan Cuisine, and the night was at turns lively and poignant. Marshallese dance group Jurbak in Mejit stomped, sang, and brought the house down. Thanks to all of the support from our volunteers and donors, we raised $6,314, which gives us a leg up in our fundraising for 2017. We recently started our annual phonathon fundraiser, where we hope to raise the rest of the funds we need to run all of our life-changing surgery and public health programs next year. Once again, we want you to know: we are so proud to have you in our mission family. Thirty-five years of service overseas is no small feat. From the catamaran hopping between islands to the packed clinics and busy operating rooms, we've come a long way in the number of people we help and the type of care we provide. Last year, we provided $3.8 million worth of care to over 5,000 people—we wouldn't have dreamed that would be possible 35 years ago. If you were there, thank you for celebrating with us. To all, thank you for joining us on this exciting journey. If you missed out on the gala, or if you'd like to remember the event, browse through the photos below. If you're inspired to share your skills, please fill out a volunteer interest form. If you'd like to support life-changing medical care in the Micronesian islands, visit our Phonathon donation page. The most sustainable way to give is by monthly recurring donations—a gift of only $25 per month has a high impact in Micronesia, but costs less than a dinner for two here in the US.